Specifications:Size: 9 Voltcapacity: 220 Mah Chemistry: Nickel Metal Hydride (Nimh)Voltage: 8.4Vbrand: Acculooptype:Low Dischargeincluded Qty: 24Features:No Memory Effectreliable Service Life Long-Lasting Performancerecharges Up To 1000 Cyclessaves You Hundreds Of Dollars Compared To Alkaline Batteriescan Be Replaced In Any Product That Uses 9 Volt Batteriesideal For The Following Applications:Microphonesremote Controlspower-Hungry Equipmentnote: Low Discharge: These Batteries Come Pre-Charged, And Can Maintain 85% Of Their Charge Even After A Year In Storage Or Standby. Valuable Information Have You Finally Decided To Make The Switch From Alkaline Batteries To Rechargeable Batteries? If So, Please Read The Following Article To Help You Make An Informative Decision. The Most Common Consumer Use Rechargeable Batteries Are Categorized By 2 Different Types; Nimh Battery (Nickel Metal Hydride) And Nicd Battery (Nickel Cadmium). The Working Voltage On Both Of These Types Is 1.2V, Whereas Alkaline Batteries Have A Voltage Of 1.5V. There Is No Need To Worry As Nimh And Nicd Batteries Will Work In Any Consumer Product That Takes Alkaline Batteries Of The Same Size. The Most Common Battery Sizes Are Aa, Aaa, C, D And 9 Volt. Rechargeable Batteries Are Rated With A Mah Milliamp Hours) Rating. The Mah Represent The Capacity Of The Battery. Therefore The Higher The Mah Rating The Longer The Battery Will Last Once It Is Charged. A Rechargeable Battery That Is Rated 2000 Mah Will Power Your Electronic Device Twice As Long As Battery That Is Rated 1000 Mah. 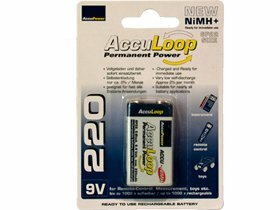 You Will Find That Higher Mah Rated Batteries Are Usually More Expensive, Which Does Not Necessarily Mean They Are Better Batteries, They Will Just Run Your Product For A Longer Period Of Time.Nimh Rechargeable Batteries Are A Newer Technology Then Nicd Rechargeable Batteries And Have Become The More Popular Choice These Days. There Are 3 Main Differences Between These 2 Types Of Batteries.